If you have caught part of a Bucks or Timberwolves game over the past year-plus – or even just some highlights – you may have come away a bit confused. Home teams wearing colored uniforms and road teams in white. Both the home and road teams wearing colors. Teams wearing colors you never knew were associated with that team. The Bucks don’t just wear green and white; they’ve added a cream choice to go with their alternate black version – oh, wait, now yellow has replaced cream, and there’s a new white getup … wait, what? And why are the Wolves wearing snot green one month and looking like the “Purple Rain” album cover the next? When Nike took over NBA uniform manufacturing in 2017, they blew up our understanding of uniform arrangements. The biggest change: There is now no such thing as a “home” or “road” uniform. Teams can wear almost any style whenever they want, as long as they avoid the same dominant color as their opponent. Teams have plenty of new options: “Association” (white; really, what used to be called “home”), “Icon” (mostly the former “road”), “Statement” (the main alternate), and “City” (an alternate with a design particular to the team’s city/region, and one that changes every season). This year, last spring’s playoff teams got “Earned” uniforms (slight alterations of one of the other alternates). Plus, some squads have “Classic” (throwback) designs. Got that? This means a lot of different looks, especially in the “City” category. Those aforementioned cream Bucks uniforms from last year were inspired by the city of Milwaukee’s “Cream City” nickname; this year’s yellow one took its cue from the brightly designed court in the Bucks ’70s/’80s-era home arena, the MECCA. Perhaps next year we will see a take on a beer stein or the Mitchell Domes. Eau Claire North/Memorial/Regis/Immanuel Lutheran: The four schools can take their pick of municipal signatures. Ideas include: lumberjack plaid, a pattern of tires, a graphical representation of two blue stripes merging – confluencing! – into one, and a phoenix wing (for Phoenix Steel and, of course, Phoenix Park). Chi-Hi & McDonell: Having a beer theme won’t fly for Chippewa Falls teenagers, so imagine something like the barns at the Northern Wisconsin State Fairgrounds across the jersey, or sublimated animal silhouettes to represent the Irvine Park Zoo. Fall Creek: Cricket cousins, inspired by Henry Cousins, for whom the city was initially named. Augusta: Baked beans and bacon, likely to become one of the most popular in our list. Eleva-Strum: Rotisserie chickens, also likely to become one of the most popular on our list. Cadott: A big line across the middle of the uniform with “45°0′N” in the center. Independence: A bugle for Bugle Lake. Mondovi: Bengal stripes for native and NFL player Tim Krumrie. Durand: Blue music notes for Blues on the Chippewa. Elk Mound: Mound Hill Park rising from the shorts with the castle on the jersey. Menomonie: A stone theme from the Mabel Tainter Center for the Arts. The problem with the NBA’s uniform approach is the lack of sustainability; if these “City” uniforms are set to change every year, we may eventually see Mall of America-themed Timberwolves jerseys or multiple years of different cheese textures for the Bucks. At some point, whatever look got the most pro shop sales will settle in as a regular alternate (whoops, “Statement”); the weirdest ideas may become their own throwbacks (my bad, “Classic”) in a couple of decades. However, while we may be in the Peak Uniform Option era of basketball, the trend does allow creative juices to flow. Some concepts will fall flat, and some may become legends of their own. Perhaps a school in the Chippewa Valley will take inspiration from this burst of design. 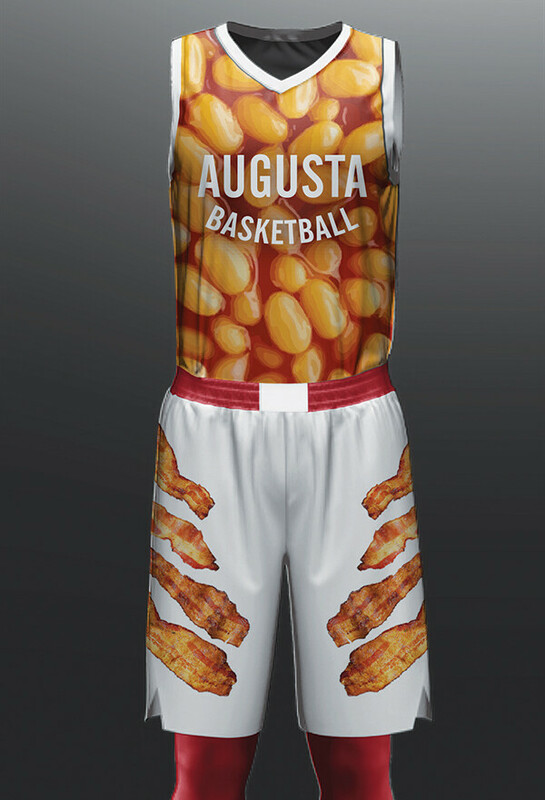 Augusta High, start planning how well beans look on a jersey; you’ll be glad you did.